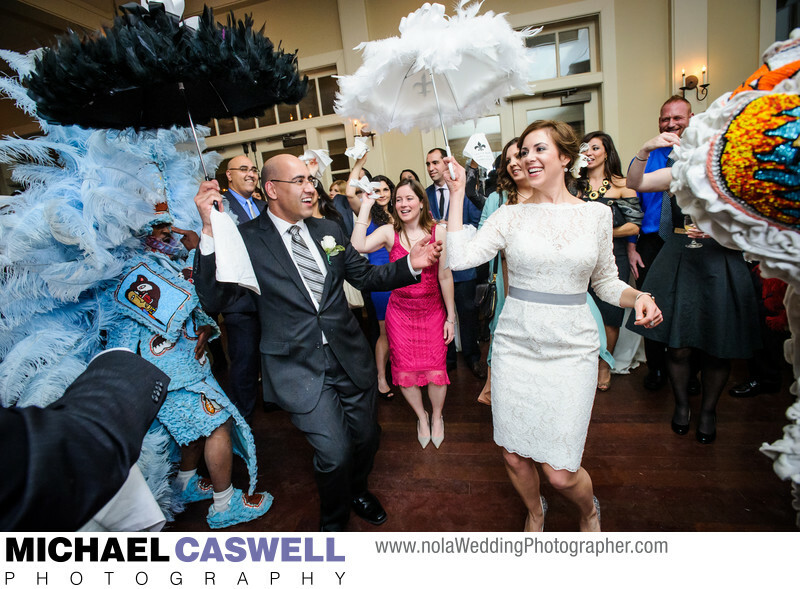 I photographed this wonderful couple’s wedding ceremony in Memphis, Tennessee, and their reception took place here in New Orleans a few months later at the Audubon Golf Clubhouse. They originally had just inquired about me shooting the reception, but liked my work so much they commissioned me to travel to Memphis to capture the ceremony as well. We started out the New Orleans portion of their wedding celebration with a portrait session that afternoon in the French Quarter and we got some great shots. We then headed over to the Audubon Park Golf Clubhouse for the reception, where Something Blue put on a great show and kept the crowd entertained. The night was capped off by a visit from Mardi Gras Indians accompanied by a brass band, giving the guests a true taste of the amazing culture the city of New Orleans is so well known for! The elaborate costumes are all strictly hand-made and can take as long as 9 months to construct. 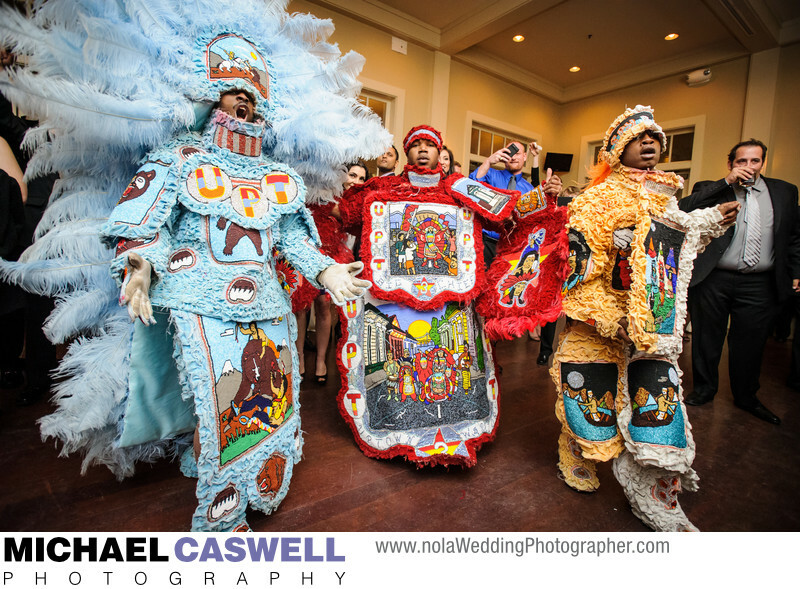 These particular Mardi Gras Indians are from the Uptown Warriors tribe. Ceremonies at this venue usually take place outside, with several options available, such as the area behind the clubhouse, graced by beautiful oak trees, or the brick-paved patio. The venue features a main room with a large bar, where most of the reception action usually takes place, as well as a separate room where the food is typically located. Larger events would be a bit tight in this space if it were all that was available, but the venue's patio and wraparound covered porch help immensely with providing other areas for your guests to eat and mingle. Another option for bigger weddings, especially if a large band is providing the entertainment, is to have the band and dance floor outside on the patio. Tent options are available for weddings taking place in colder months or if adverse weather is predicted. Location: 6500 Magazine St, New Orleans, LA 70118.